Walter Sabalauski was born on March 31, 1910, in Lithuania. He enlisted in the U.S. Army on June 3, 1941, and after radio operator and infantry training, he deployed to the Pacific Theater in April 1942. SFC Sabalauski served in combat in the Solomon Islands, Guadalcanal, and the Philippines, returning to the U.S. in April 1945. He received an honorable discharge from the Army on June 25, 1945, and returned to active duty on March 18, 1948. During the Korean War, MSG Sabalauski served with the 187th Regimental Combat Team and the 25th Infantry Regiment in Korea from March 1951 to March 1952, and later served with the 325th Infantry Regiment at Fort Bragg, North Carolina, until November 1960. His next assignment was with the 504th and 509th Infantry Regiments in West Germany from November 1960 to October 1963, followed by counterinsurgency training at the U.S. Army Special Warfare School at Fort Bragg from October to December 1963. He deployed to Southeast Asia in December 1963, and served as an advisor with the 32nd Vietnamese Ranger Battalion from December 1963 to December 1964. 1SG Sabalauski served with the 325th Infantry Regiment at Fort Bragg from January 1965 to April 1966, and during this time he deployed in support of the Invasion of the Dominican Republic from April to September 1965. He then returned to South Vietnam where he served as a First Sergeant with the 502nd Infantry Regiment and 101st Airborne Division, and as Sergeant Major of 2nd Battalion of the 502nd Infantry Regiment from April 1966 to October 1967. His next assignment was as Cadet Regimental Sergeant Major at the U.S. Military Academy from November 1967 to July 1968, followed by service as Sergeant Major of the 2nd Battalion, 502nd Infantry Regiment in South Vietnam from September 1968 to October 1970. His final assignment was as Command Sergeant Major of the 2nd Battalion, 508th Infantry Regiment of the 82nd Airborne Division at Fort Bragg from November 1970 until his retirement from the Army on April 1, 1972. Walter Sabalauski died on August 9, 1993, and was buried at Arlington National Cemetery. For extraordinary heroism in connection with military operations involving conflict with an armed hostile force in the Republic of Vietnam, while serving with Company C, 2d Battalion, 502d Infantry, 1st Brigade, 101st Airborne Division. 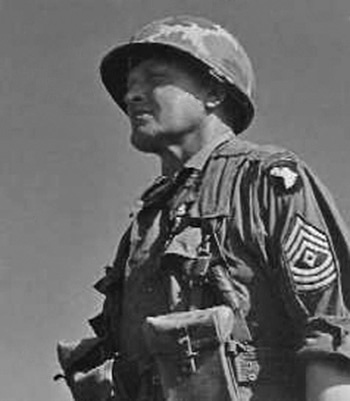 First Sergeant Sabalauski distinguished himself by exceptionally valorous actions during the period 9 to 11 June 1966 while participating in a blocking operation near Dak To. When the Viet Cong occupied jungle suddenly erupted with intense hostile fire from three directions, First Sergeant Sabalauski, realizing that the company commander could not possibly control all the elements in the thick bamboo growth and 50 foot canopies, rallied and directed the beleaguered troops in an attempt to gain fire superiority. With complete disregard for his safety, First Sergeant Sabalauski dashed from position to position and repeatedly exposed himself to muster his unit and quell the hostile fire. As the Viet Cong assaulted the perimeter, First Sergeant Sabalauski quickly organized an assault line and delivered suppressive fire onto the fanatical Viet Cong. After dashing to the rear of the perimeter and observing that the insurgents were surrounding his company, he exposed himself and screamed orders to form a tight defensive perimeter. Although artillery was called in as close as 25 meters from the friendly force and air strikes devastated the jungle around the perimeter, the determined Viet Cong continued to advance. When the company commander called in air strikes on his own position as a last resort, First Sergeant Sabalauski remained on his feet to control the beleaguered paratroopers. For 30 hours, he continued to dash from one side of the perimeter to the other to direct and encourage his men. Although he was wounded himself, First Sergeant Sabalauski aided his wounded comrades, comforted the dying, and continued to direct his men. When reinforcements arrived and a hasty perimeter was again set up, he fearlessly moved forward of the perimeter and retrieved a dead comrade. After a 1,000 meter move to an evacuation point, First Sergeant Sabalauski personally supervised the extraction of the wounded and dead. Through his courage and outstanding leadership throughout the long and perilous battle, he contributed immeasurable to the defeat of the determined Viet Cong. First Sergeant Sabalauski's extraordinary heroism in close combat against a numerically superior hostile force was in keeping with the highest traditions of the military service and reflects great credit upon himself, his unit, and the United States Army.